Not once have I actually written “cleaning” on my holiday to-do list and, yet, when it comes down to entertaining, cleaning is one of the things that pushes me over the edge. You know what I’m talking about: you’ve got your heels on and you realize there’s a ring around the toilet. In the interest of saving you and yours some holiday hair pulling and maybe even some last-minute tears, here are a few of my favorite cleaning tips and products that will not only help beforehand but will make cleaning way less gross if you do find yourself with an up-do and a dirty bathroom. I don’t mean you need to be one of those super humans that dusts every night. There are, however, some sneaky things you can do to keep things from getting super dirty to begin with. For instance, put Epsom salts in your bathwater to keep soap scum from building up in the tub. And have you heard of the rimless toilet? Under the rim… that’s the part that get’s extra dirty, so take away the rim and add in extra strong swirling action, and you’ve got the Cascade toilet. In addition to the self cleaning toilet properties, it’s also a high efficiency toilet at 1.28 gpf, saving 20% more water than the 1.6 gpf toilet. Save yourself from dirty work and save dollars on water so you can serve fancy hors d’oeuvres. I used to be embarrassed when someone inevitably peeked inside my oven during a dinner party. That is, until I started dousing the oven with cleaner on the nights we eat out. Let it sit overnight then give it a good wipe. So much easier than waiting until it takes a chisel to remove the char. There used to be an extra special feeling in my lungs after I’d bleached the color out of the bathroom tile. 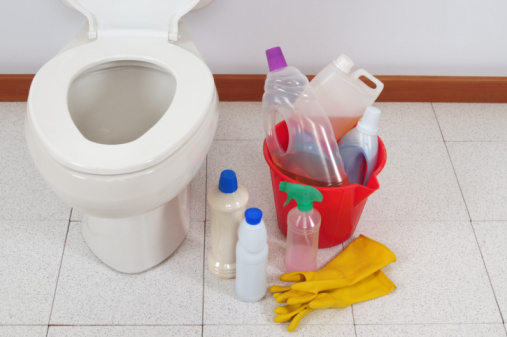 Believe it or not, you can get your dirtiest cleaning jobs done without using harsh chemicals. I have one bottle filled with vinegar and water. That cleans pretty much everything, along with some baking soda and borax. Seriously, you can clean an entire house with these three things without singeing your precious lungs. Other tips: use baking soda and water on shower doors, use a halved lemon on faucet water spots, and grab olive oil to clean stainless steel surfaces like dishwashers and refrigerator doors. I can’t stand vacuuming. So cumbersome. That’s until I invested in a heavy duty vacuum cleaner that is seemingly fueled by pet hair (a Dyson, if you’re curious). I also own a high-powered steam iron, because ironing is a thankless job but sometimes it has to happen (a Rowenta). I now believe that it’s worth it to invest in appliances and cleaning products that will help you get the job done in the most pleasant way possible. It might even change how you feel about your most hated chores, so that you’re not waiting until a molehill is a mountain to do the really hard work. Now, if you’ll excuse me, it’s time to jingle some bells.